The other day, I saw this video on Facebook. 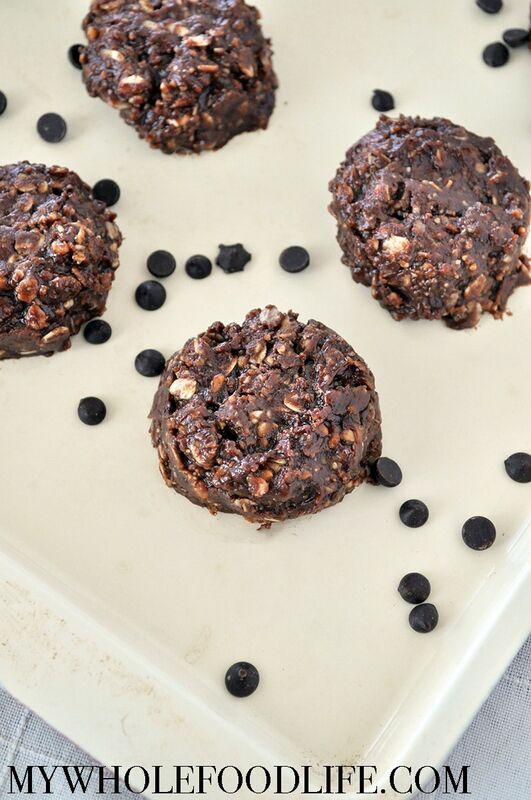 It was the inspiration for these No Bake Oat Cookies. My recipe is not only healthier than the original, it is also vegan. Yay! And really, who doesn’t like a no bake cookie? You can literally whip these delectable cookies up in just a matter of minutes. These could not be easier to make. Just 5 simple ingredients and you are on your way to chocolate peanut butter heaven. If you have a nut allergy, you can easily use sunflower butter in place of the nut butter. I know you will enjoy these No Bake Oat Cookies as much as I did! If you want more healthy and easy cookie recipes, you can check out this link. Check out this video below for a tutorial. For more videos, you can subscribe to my You Tube Channel. The easiest cookie you will EVER make!! In a medium saucepan , on medium heat, mix the coconut oil, maple syrup, peanut butter and chocolate chips. Then add in the oats and stir until the oats are well coated. Use a cookie scoop to drop cookies onto a lined baking sheet . Place the cookies in the fridge to set. It should take about 30 minutes. Keep these cookies stored in the fridge or freezer. Enjoy! These look so good, but I don't have access to vegan chocolate chips. Could I use Hershey syrup, cacao or cocoa powder instead, and how much? Thanks. Oh my God, Melissa, they are amazing! These are not cookies, this is pure chocolate peanut butter bliss....I will need to keep them in a locked box in the fridge so I don't eat it all at once! By the way, I used honey instead of maple syrup and it worked out great. Can I post this on my FB wall? You are a genius, and your recipes rock! Aw, thanks Valeria! You are more than welcome to share the recipe link on your Facebook wall, but please do not copy and paste the recipe. Thanks!! Of course I would share it. Thanks! People have to try this. And so easy to make! I used dark cooking chocolate, and OMG! My kids and I made these last night. They tasted fantastic but ours were pretty dry and crumbly. Any idea why? We didn't change anything from your recipe. We LOVE everything you post, BTW! Really yummy and I'm not even a peanut butter fan! Yay!! So glad you like them. Unfortunately I am allergic to coconut, what can I use instead of coconut oil? You may just be able to omit it? Scrumptious!!!! Best snack I have had in a while! Thanks for what you do! You are so welcome Beth! Followed the recipe to the letter and ended up with 20 of the best dang cookies I've had in a while. It was easy to eat a lot of these. YUM YUM YUM. Yay!! So happy to hear you liked them Jennifer! Mine were really thick and didn't cover all of the oats. Any suggestions? Thanks! Sorry that happened. :( Maybe the heat was too high when you mixed everything together? If the mixture looks a little thick, you can always add a little extra coconut oil. That happened to me last time. I added some almond milk as I didn't think of adding more coconut oil at the time, and it also worked. Hi Melissa, Just thought I'd let you know that I substituted oats for nuts to make this work for Jewish Passover, and it turned out great as well. A bit like nut clusters, but so so good! Really yummy! So versatile. That is so great to hear Valeria! I love how versatile the recipe is. These looks so decadent and gooey and yummy! I cant wait to try these!